For many of us celery is rather an under-rated salad crop, but it has so many uses. Yes, it tastes weird, but add a bit of cream cheese and it become the perfect accompaniment. But it is in its use for bulking salads, creating stocks, and as a base for soups and stews that it becomes invaluable, and you will be surprised at just how much celery the enthusiastic cook will get through in a year. So much so that growing your own celery can become extremely valuable. Not only is it hardy and easy to grow, its weird flavour is so much more intense and - more importantly - you can guarantee that it has not been bathed in a cocktail of pesticides and fungicides. Celery is an ancient food having been cultivated in the Mediterranean region for more than 3,000 years. It is excellent for weight management diet as its high water content and fibrous nature means weight watchers can eat this vegetable a lot without fearing of weight gain. It is high in Vitamins B1 and B6, Vitamin C, calcium, fiber, folic acid, potassium, and antioxidants. Kidneys can benefit from celery as it helps in eliminate body waste through urine. Eating celery will reduce high blood pressure risks, relief arthritis pain and suppress cancer cells growth. So, how do you grow celery from seed? Because celery has such a long maturity time, unless you live in a location with long growing seasons, you need to start celery seeds indoors at least 8 – 10 weeks before your expected last frosts. Because you will be starting off your celery seed under protection, you will need to use either 3 inch pots or large module trays filled with a good quality seed compost such as John Innes 'Seed and Potting'. Celery seeds are tiny and tricky to plant, so try mixing them up with some horticultural sand first and then sprinkling the sand/seed mix over the pots or modules that you are starting the celery plants in. 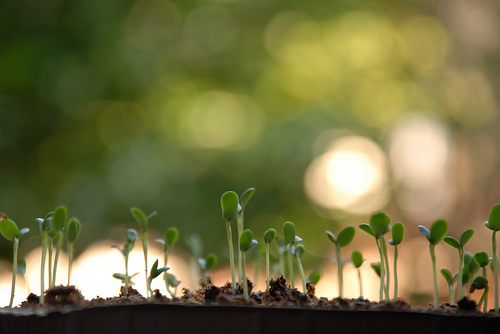 Cover the seeds with just a thin layer layer of soil as celery seeds definitely like to be planted shallowly. Gently water in, you may wish to to sit the tray/pots in a pan of water and allow the water to rise through the compost using capillary action. Once the celery seeds are large enough, either thin the seedlings or prick them out to their own pots. Once the temperatures outside are consistently above 50F, you can plant your celery into your garden. Remember that celery is very temperature sensitive, so don’t plant it out too early or you will kill or weaken the celery plant. Unless you live in a location that is ideal to grow celery plants, you are best planting your celery where it will get 6 hours of sun, but preferably somewhere that the celery plant will be shaded for the hottest part of the day. Also, make sure that where you will be growing celery has rich soil. A growing celery plant needs a lot of water so make sure that you keep the soil evenly moist and do not forget to water them. Celery can not tolerate drought of any kind. If the ground is not kept consistently moist, it will affect the taste of the celery. 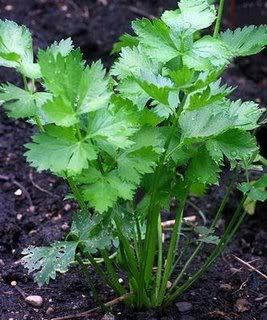 You will also need to fertilize regularly as celery plants require plenty of nutrients. Many gardeners prefer to blanch celery to make them more tender, but be aware that when blanching celery, you are reducing the amount of vitamins in the celery plant. 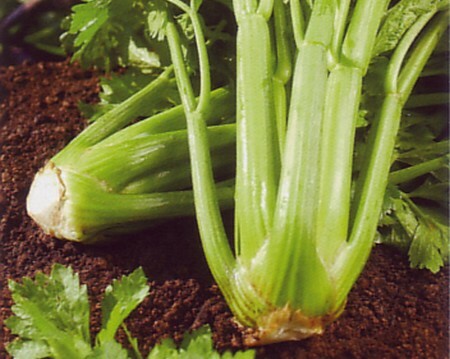 Blanching celery is when you artificially turns the lower green part of the plant white. Blanching celery is done in one of two ways. The first way is to just slowly build a mound of soil around the growing celery plant. 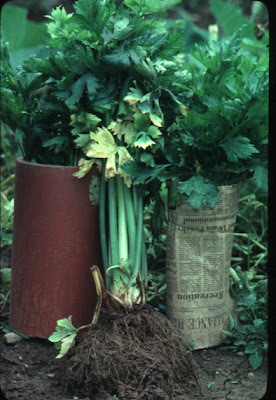 Every few days you would add a little more soil and at harvest time the celery plant will be blanched.